Mega Sale! Up to 25% off on Dirty Rice at Smokey Robinson Foods. Top brands include McCormick, Tony Chachere's, Lousiana Fish Fry Products, & Zatarain's. Hurry! Limited time offers. Offers valid only while supplies last. 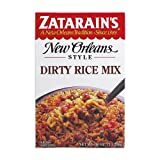 Zatarains Dirty Rice Mix, 40 Ounce - 6 per case. 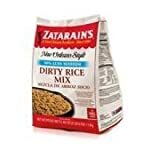 Zatarains Dirty Rice Mix, 40 Ounce -- 8 per case.